Neither player wanted to make an early mistake. In the Kobolds and Catacombs meta, Control Warlock has emerged as one of the best slow decks in Hearthstone. Thanks to some excellent new tools from the expansion, the deck has one of the strongest sets of late game tools seen in any recent meta. Voidlord, the Warlock Spellstone, and Rin the Disciple helped push the deck up the pecking order, with previous expansion cards like Gul’dan Bloodreaver also powering the deck. It can be a difficult deck to play at times, with the smallest of early game decisions affecting the fatigue at the end of the game. This difficulty was on display in the final of the ESL UK Premiership tournament, as Big Ben and Toastmonster played out a mirror match with two variants of a control-focused Warlock. Warlock had been banned through most of the tournament, making this a rare sight. And for the first four turns, the players did basically nothing. Aside from one tap from Big Ben, the players just passed the game back and forward in the early going. They both had cards they could play, but they just wanted to take as little damage as possible. 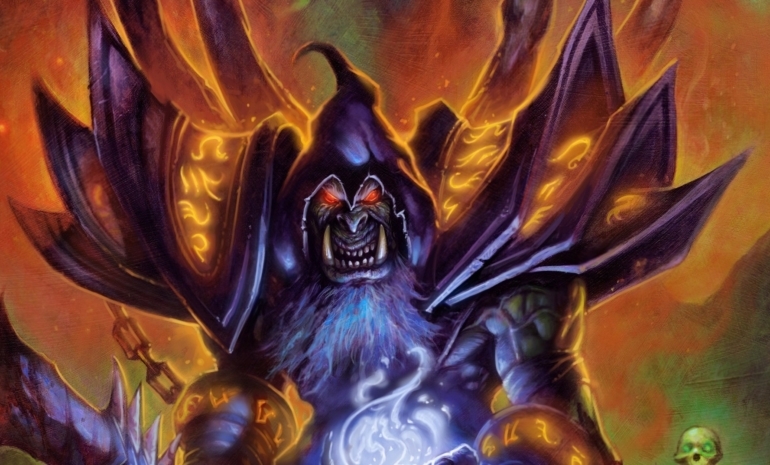 The next focus of the deck is to use as few resources as possible early on, with both players pulling out Voidlords just to power up their Bloodreaver Gul’dan plays. Both players went with the Hero card as early as possible to get the hero power and begin sucking face. It looked like Toastmonster might have got his strategy wrong though. He used his Defiles and Hellfires early—but it became apparent that Toastmonster was playing Rin while Big Ben wasn’t. That gave him a pretty big advantage. It all came down to the final turns in fatigue, and Toastmonster gave Ben a huge opening. Toastmonster completely disrespected the Dirty Rat and Twisting Nether combo, but got very lucky in the subsequent 50/50 to win that game. The ESL Premiership was somewhat unique with its format, playing true double elimination. Big Ben won the upper bracket, meaning that Toastmonster had to beat him twice. Toastmonster did manage to reset the bracket 3-2 with the help of his Warlock, but Ben banned it out the second time round and won the tournament 3-1 in the run back.